I’m 68 years old. I’ve had multiple sclerosis since I was 32. I’m not sure where I expected this disease would take me when I was diagnosed 36 years ago, but I hoped that MS wouldn’t steal too much of my life from me. I certainly never thought of the possibility that I might live to a really old age as an MS patient. Chattanooga’s Louise Miller, who turned 95 years old on Nov. 12, was featured in a Chattanooga News-Free Press article way back in 1979 after being named the area’s “MS Mother of the Year.” If you are counting, that was 37 years ago. Miller still has a framed copy of the newspaper article on her wall. It was a big, six-column story. She was pictured with her now-deceased husband, Austin, who owned Scenic Land Printing and Sales Co. She was lauded in print as a mother of four and energetic volunteer for the MS Society, an avid gardener and member of the Red Bank Presbyterian Church. Today, Louise Miller lives at the Manorhouse Assisted Living and Memory Care facility on Mountain Creek Road under the care of a watchful staff. Her daughter, Susan English, lives in Texas and monitors her mother on an internet-connected camera. At the time she was diagnosed decades ago, Miller was a vibrant middle-ager. “At the time, it took us by surprise,” remembers her daughter. “We thought it was a death knell. Back then, there were no drugs and no cure.” Until her early 80s, Miller battled MS by resisting a wheelchair. She used canes to walk until her balance became so unsteady that she could no longer get around safely. Yet, here she is at 95, an inspiration for middle-age people today facing MS. With advancements in medicines and good medical care “people with MS may live an average of about seven years less than the general population,” according to the national MS Society. About three years ago, Miller’s condition became grave and doctors feared the worst. In fact, they began to use the words that are often a prelude to death. 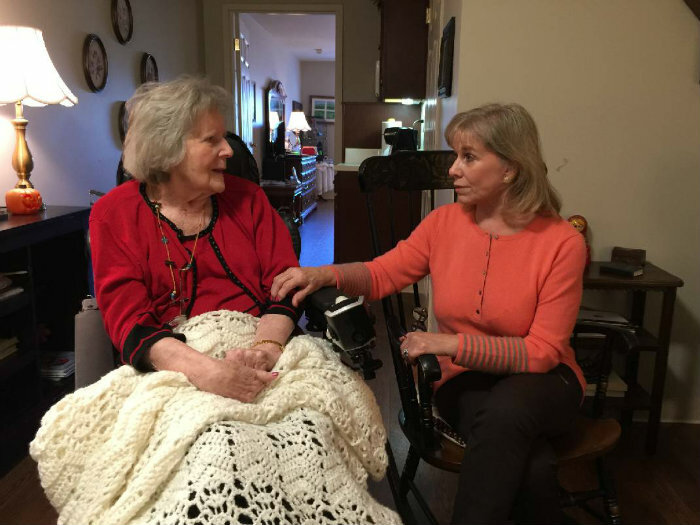 “They said, ‘Your mother has lived a good, long life,'” remembers her daughter. At that point, English abruptly turned to her mom and asked: “Mom, do you want to live to be 100?” “Well, of course I do,” she replied. With that, English invited the assembled doctors to get onboard with her mother’s wishes, or the family would find a new team of physicians. MS, the great time thief, has been held at bay.